+ 4 = twelve Required Please enter the correct value. Another reason oil was fueled higher Tuesday was a decrease in supply. 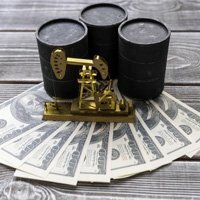 A handful of reports out this week, including data from the American Petroleum Institute, are expected to show a further drop in U.S. crude inventories due to production cuts in the Gulf of Mexico, a result from Tropical Storm Debby. Analysts in a preliminary Reuters poll forecast a 2.2 million barrel drop in supply. This is in sharp contrast to recent reports of record production in North America which had helped bring oil prices down. That surge in production can only hold oil down for so long before other factors kick in. Fresh hopes that more economic stimulus is on the very near horizon is another major oil price catalyst. More central bank action is expected in the U.S., Europe, and China. While some worry that Europe's debt mess will derail oil demand, Europe actually accounts for a small part of global oil consumption. As Money Morning Chief Investment Strategist Keith Fitz-Gerald explained, Europe's largest economies don't even comprise 11% of global oil consumption. That means even if oil consumption dropped 20% in Germany, France, Italy, the U.K., and Spain, it would only push consumption down by an insignificant 1.9 million barrels a day. Instead, said Fitz-Gerald, the key lies in the United States and China. "The United States and China together account for roughly 32.5% (or roughly 28.26 million barrels a day) of global oil consumption," Fitz-Gerald wrote Tuesday to subscribers of his Geiger Index service. "Both countries are still growing, albeit more slowly than we'd like to see. A 2% increase in the U.S. economy (median forecast) could translate into an additional 373,800 barrels a day of demand. A 7% increase in China's economy (also a median forecast) could translate into an additional 574,000 barrels a day. Factor in Russia, India, Japan, along with emerging economies in Latin America and the Pacific Rim, and you get back to a hefty and very probable increase in global oil demand." "The Wall Street Journal corroborates this, noting that global demand is expected to increase 1.2% in 2012 and another 1.5% in 2013, which would bring global oil demand to 90.33 million barrels a day," Fitz-Gerald added. While oil has taken a beating over the last few months, it appears overdone and Tuesday's rally was warranted. Fitz-Gerald noted, "Traders are overreacting. They've priced oil (and its related options) as if the world is going to stop turning tomorrow."